New Brunswick’s District Education Councils (DEC) are committed to guiding and moving forward the education of all students. This site will explain the role and responsibilities of DEC, provide links to the DEC in your school district and provide more information on how you can get involved in local governance. What is a District Education Council (DEC)? District Education Councils were first established in 2001 to provide local governance and community input in the education system. The Education Act currently provides for 11 to 13 elected education councillors for each of the school districts. 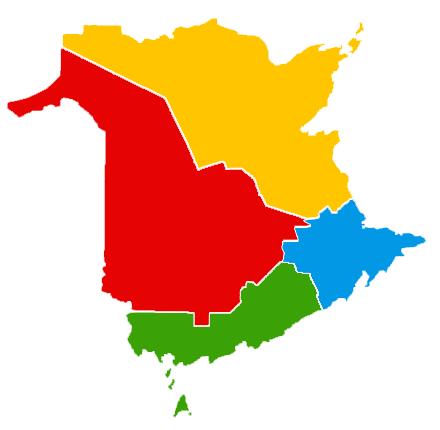 There are 4 anglophone and 3 francophone districts with 7 -13 elected members on each council. DECs use a policy governance model. They set and monitor the policies and objectives to be carried out by the district staff and local schools. Each DEC must work within the policies and standards of the Department of Education and Early Childhood Development. DECs develop objectives and policies to address the priorities and needs of their district. Members are not involved in day-to-day decision-making and do not deal with issues regarding individual students. are committed to guiding and moving forward the education of all students. Learn more about the current DEC, PSSC, local policies and meetings by clicking on your District below or on the map to the right.